Advertisers who cut back on newspaper spend are less effective, according to research released by newsbrands' marketing body Newsworks. The study, by effectiveness consultancy Benchmarketing, used 500 econometric models to show that advertising with newspapers increases overall revenue return on investment by three times. It also said adding newspapers to a retail campaign increases effectiveness by 2.8 times (just under 200%), while for cars effectiveness was boosted by 71%. 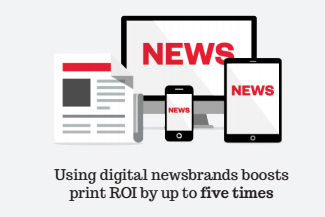 It is claimed by Newsworks that newspaper advertising in a campaign doubles the effectiveness of TV, while online display becomes four times more effective. These figures were backed up by OMD's head of display, Andy Hargreaves, who complimented Newsworks on defending itself against so-called "printism". Hargreaves said: "You do see higher negativity around newspapers around younger marketers, but at the end of the day you get more wealth with over 50s and 55-year-olds who are still reading newspapers. "If you look at Tesco and Asda, who were among the top print advertisers in the last four or five years, their spend has decreased by 30-35%. You're seeing the spend drop faster than the rate of audience drop, which is unusual." Newsworks presented the findings at its first effectiveness summit this morning in an attempt to present hard evidence of the impact newsbrands have on ad campaigns by boosting the effectiveness of other media. Claire Harrison-Church, the vice-president of marketing at Asda, said: "Newsbrands are a crucial part of Asda's marketing mix because they provide us with an influential and flexible platform that we use to inform and inspire our customers. "The ultimate goal of our comms is to deliver returns and this large-scale study allows us to continue to invest with confidence. Retailers know that adding newsbrands to a campaign increases the effectiveness of other media – here we have the evidence to prove it." The ROI study forms part of Newsworks’ wider effectiveness programme, which includes analysis of the IPA Databank by Peter Field, multi-platform tests into brand health conducted by BDRC Continental, plus a dedicated effectiveness microsite. Tom George, chairman of the IPA Media Futures Group and chairman of UK and Northern Europe for MEC, said: "It is good to see the newspaper industry collaborating on this important issue and undertaking research to defend itself against some of the entrenched negativity in the market. There is a real appetite for evidence of the effectiveness of newsbrand advertising." "We kiss the paywall now"